A 2 dram* (1/4oz) glass dropper bottle of Apple Stem Cell Malus Domestica. *You may choose a larger size. *Technology Alert!! Teach your skin how to BEHAVE YOUNG again! With a little nudge in the right direction, your skin can learn how to turn back the clock. Apple Stem Cells will help your very own skin's stem cells learn how to rebuild new tissues properly - and - teach them how to DELAY aging. Learn more about this process below, and start adding Stem Cells into your skin care regemin now. Increase vitality of skin stem cells. PhytoCellTec's Malus Domestica is a liposomal pre parathion based on the stem cells of a rare Swiss apple. Uttwiler Spatlauber is an endangered apple variety that was well-known for its excellent storability and thus its longevity potential. Mibelle Biochemistry has developed a novel technology enabling the cultivation of rare and endangered species like Uttwiler Spatlauber. Thanks to this technology called PhytoCellTec, plant stem cells can be obtained and incorporated into cosmetic products to ensure the longevity of skin cells. Helps skin stem cells to maintain their characteristics and their capacity to build new tissues. Delays aging and has an anti-wrinkle effect. PhytoCellTec's Malus Domestica is the first plant stem cell active ingredient on the market whose effect was evaluated on human skin stem cells. This unique and revolutionary ingredient is able to protect the most precious skin cells, the skin stem cells, against premature aging. Epidermal stem cells were obtained using the novel Progenitor Cell Targeting. They were then cultured for different numbers of passages with and without 0.01 % Malus Domestica stem cell extract. Afterwards, their capacity to form a stratified epidermis was evaluated. 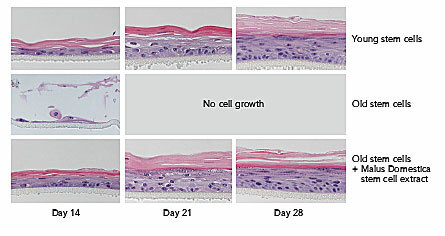 "Young" epidermal stem cells obtained from early passage (passage 5). "Old" epidermal stem cells obtained from late passage (passage 14).The Malus Domestica stem cell extract was added to the culture from early passage. "Old" epidermal stem cells lost their capacity to build a 3D epidermis. But, if treated with Malus Domestica stem cell extract from their early passage, "old" epidermal stem cells retain their capacity to form a stratified epidermis. This 3D epidermis was made of all 4 epidermal layers (stratum basale, spinosum, granulosum, corneum) and was indistinguishable from the one obtained with the "young" epidermal stem cells. In presence of Malus Domestica stem cell extract, skin stem cells keep longer their ability to proliferate and to undergo the complex process of stratification and differentiation. Thus, the Malus Domestica stem cell extract helps the epidermal stem cells to retain their capacity to build new tissues. The anti-wrinkle effect of PhytoCellTec Malus Domestica was evaluated in a study with 20 volunteers aged from 37 to 64. An emulsion containing 2% of PhytoCellTec Malus Domestica was applied twice daily for 28 days to the crow's feet. 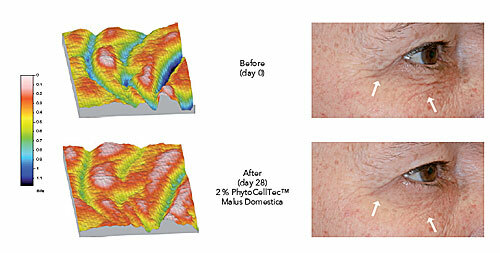 Wrinkle depth was determined by means of PRIMOS (phase-shifting rapid in vivo measurement of skin). Results showed a significant and visible decrease in wrinkle depth for 100% of the subjects. PhytoCellTecttm is a registered trademark of Mibelle Biochemistry. The information contained in this publication is provided in good faith and is based on our current knowledge. No legally binding promise or warranty regarding the suitability of our products for any specific use is made. Claim ideas are offered solely for your consideration, investigation and verification. Mibelle Biochemistry will not assume any expressed or implied liability in connection with any use of this information. Purified water, Malus Domestica (apple) fruit cell culture extract, Glycerinek Ethoxydiglycol, Phenoxyethanol, Sodium Hyaluronate, Caprylyl Glycol, Lecithin, Polysorbate 20, Hexylene Glycol, Gynostemma Pentaphyllum Extract, Panax Ginsing Root Extract.